But a recent story in Us Weekly reveals that this extends to parenting challenges like screen time, as well. According to the article, a source close to the royal couple explains that iPads have been banned at home. "They're very much seen as Mummy and Daddy's toys, not for children," says the source. As any parent knows, technology can be both a blessing (like when you need to distract your tot on a four-hour plane ride) and a curse (like when you forgot to lock your smartphone and your kid accidentally texts your boss). While we're not sure that we'd be willing to declare an all-out ban on iPads at our home, we can certainly applaud the royal couple's efforts to give their children an imagination-filled upbringing. A palace insider added, "They're very much a normal family." (You know, just with tiaras and chauffeurs). Princess Charlotte falls over as she, Prince George and their parents, the Duke and Duchess of Cambridge, visit Airbus in Hamburg, Germany. Britain's Princess Kate, the Duchess of Cambridge, attends to her children Prince George and Princess Charlotte (R) as they visit an Airbus helicopter on the tarmac of the Airbus compound in Hamburg, northern Germany, on July 21,2017. The British royal couple are on the last stage of their three-day visit to Germany. 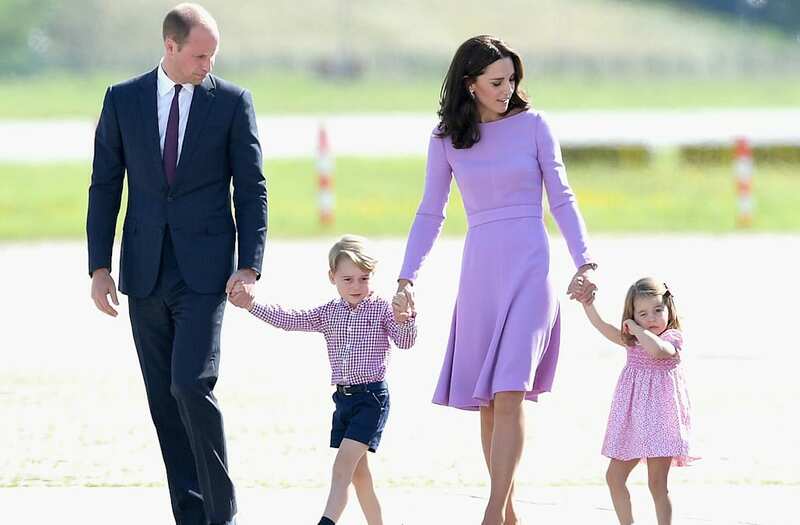 Britain's Prince William, Duke of Cambridge and his wife Kate, the Duchess of Cambridge, and their children Prince George and Princess Charlotte board thier plane on the tarmac of the Airbus compound in Hamburg, northern Germany, on July 21,2017. The British royal couple are on the last stage of their three-day visit to Germany. The Duke of Cambridge boards a plane in Hamburg with Princess Charlotte at the end of the visit to Germany with his wife the Duchess of Cambridge and Prince George. Prince George sits in a rescue helicopter as he visits Airbus in Hamburg, Germany with his parents and sister. Prince George and Princess Charlotte as they visit Airbus in Hamburg, Germany with their parents, the Duke and Duchess of Cambridge.